Blepharitis is a common eye condition which is most likely in people over 40 but can happen at any age. Understand the sign and symptoms and the treatment options for this eye condition. 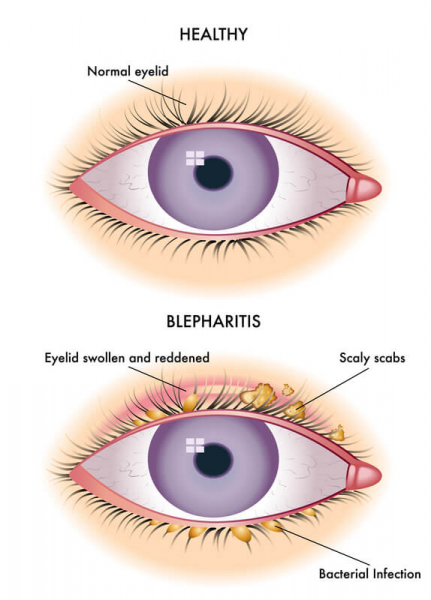 Blepharitis is a common eye condition that causes your eyelid edges to become sore and inflamed. It is most common in over 40s but the condition can develop at any age. Anterior Blepharitis – When the skin around the bottom of your eyelashes becomes swollen. Posterior Blepharitis – When the Meibomian glands on your inner eyelids become inflamed. As the causes of each type can be related, it is possible to have both forms of the condition. Sticky eyelids that don’t open easily in the morning. A gritty or stinging feeling in your eyes. Swelling in the margins of your eyelids. Irregular growth of your eyelashes. In severe cases you may experience loss of eye lashes. If you suffer from seborrhoeic dermatitis (when your skin becomes flaky or oily), you may also experience oily skin and dandruff. If you have a skin condition known as rosacea, you may develop spots and facial redness. If you have dry eye syndrome, your eyes can become red and swollen. There are a number of complications that are connected with blepharitis, however it is uncommon for these to become severe. Some can affect your eyesight, although diagnosing and treating them can prevent damage from becoming permanent. Dry eye syndrome is when your eyes are not producing enough tears or the tears dry out too rapidly. It can result in inflammation of the eyes, and a sore and gritty feeling. As they can influence your tear production, the conditions known as rosacea and seborrhoeic dermatitis can lead to dry eye syndrome as well as blepharitis. Conjunctivitis is when the membrane over the outer layer of the eyeball and the inner layer of the eyelid, known as the conjunctiva, becomes inflamed. It can happen as a result of bacteria from the eyelid infecting the eye, causing the inflammation. Conjunctivitis normally passes after a few weeks without treatment, but if you believe you have it you should talk to your eye care specialist or GP. A Meibomian cyst is a swelling inside your eyelids that can happen as a result of a Meibomian gland becoming inflamed. Your Meibomian glands are where the oily part of your tears are produced, and they can become inflamed due to blepharitis. The cysts rarely hurt unless they become infected, in which case your GP may prescribe antibiotics. They often disappear on their own but a hot compress can help the inflammation come down, and if the cyst doesn’t disappear it can be removed via surgery. Styes are swellings that occur when an eyelash follicle becomes bacterially infected. They can be painful depending on how serious they are, and they often secrete pus. You can treat a mild stye with a warm compress but more serious cases may need to be drained with a needle. Keratitis is when the cornea becomes damaged, and can happen as a result of severe blepharitis. 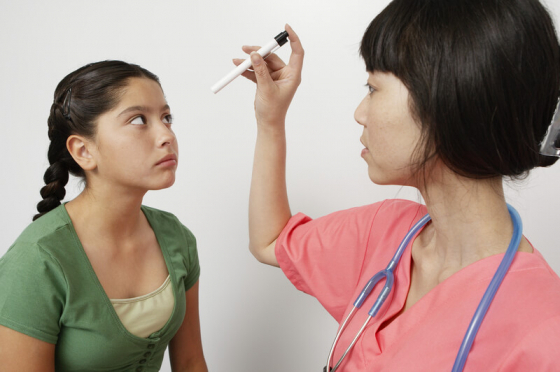 It can lead to corneal scarring or ulcers which could affect your vision. If you have corneal damage you may show symptoms such as photophobia, vision deterioration, and pain in your eye – if you experience these symptoms you should contact your GP or emergency eye care service, and if this is not possible then visit the nearest A&E. The causes of both anterior and posterior blepharitis can often be linked. Bacterial infection – Bacterial infections such as staphylococcus are often linked to blepharitis. Many people have staphylococcus bacteria living on their skin, but for some they can cause inflammation of the eyelids. Seborrhoeic Dermatitis – This is a skin condition that can result in oily or blistering skin, sometimes causing the eyelids to become irritated. Demodex – Demodex are mites that can live on eyelashes. They can result in someone getting blepharitis either because the eyelids become damaged, or because some people may have a sensitive reaction to them. Demodex mites may also be a cause of posterior blepharitis. Seborrhoeic Dermatitis – Overproduction of the oily matter in the Meibomian glands has been connected to the skin condition. Rosacea – Blockages in the glands can often be due to Rosacea, a condition that causes reddening of the face. Around half of people who have the condition develop eye problems such as blepharitis. Blepharitis can normally be diagnosed by your optometrist or GP after checking your symptoms and inspecting your eyes. If the symptoms become serious or the treatment initially doesn’t work you may be referred to an eye specialist known as an ophthalmologist, who will conduct further tests and treatments. How do you treat Blepharitis? Blepharitis often occurs in recurrent episodes, with spaces in between where there are no symptoms. There is usually no way to cure it, but hygienic eyelid care can help manage the symptoms. Keeping your eyelids clean is an important part of controlling blepharitis – even when you aren’t currently displaying symptoms, good eyelid hygiene can help prevent them from flaring up. Using a warm compress on your eyelids for around 5-10 minutes can melt the build-up of oils in the Meibomian glands. Rubbing a cotton wool bud over your closed eyelids can help clean up any crust and oil build-up. Using a cleaning solution with a warm compress can make it easier to clean the edges of your eyelids, however you should avoid touching the inside of the eyelids as they may become sore. You should clean your eyelids twice daily while the symptoms are bad, and once a day as they get better. To make a cleaning solution you can add a small amount of baby shampoo or a teaspoon of bicarbonate of soda to a pint of boiling water, letting it cool before you use it. There are also many commercial eyelid cleaning solutions available, but it may require trial and error to find one recipe or brand that suits you. If regular cleaning does not help ease the condition, your GP may prescribe a course of topical antibiotics. These can last for 4-6 weeks, and the antibiotics normally take the form of ointments, creams, or eye drops. To apply the ointment or cream, use a cotton bud or clean fingers to lather it onto the affected parts of the eyelid – initially you may have to do this a number of times a day, but as you get better you may only have to apply it once daily. If you use antibiotic eye drops, you should avoid wearing contact lenses as the drops can collect behind the lens and irritate the eye. Your GP may prescribe preservative free eye drops if you want to continue wearing contact lenses as they are less likely to do this. You should leave five minutes before applying a second type of eye drop if you are using more than one. If other treatments aren’t successful or if your GP believes the skin condition rosacea is affecting your symptoms, they may prescribe oral antibiotics. They may show positive effects within a few weeks but the full course could last for up to three months – you should always take antibiotics until the course is finished, even if your condition improves. A possible side-effect of some oral antibiotics can be an increased sensitivity to sunlight, therefore you should avoid sustained exposure to the sun and other sources of UV light such as tanning beds and lamps. Other side effects can include vomiting and diarrhoea, and the antibiotics may also cause yeast infections in women. However as the dosage is usually low these effects are rare. Oral antibiotics aren’t usually prescribed to pregnant or breastfeeding women or children under 12 as they can affect young and developing children. As blepharitis can often be linked to other conditions, these may also require treatment. Anti-dandruff shampoo can be helpful for seborrhoeic dermatitis or dandruff, while artificial tear eye drops can be used for dry eye syndrome, a condition that often occurs at the same time as blepharitis. Have a question? We'll respond as quick as we can. First Name Last Name Email Operating Company Lead Source Website Website Lead Record Type Business Line By signing up, you confirm that you agree to the storage and processing of your personal data by Essilor in accordance with the terms set out in the Privacy Statement.